A meeting with Mr. Mahabubur Rahman Chowdhury, Mayor (Acting) of Cox’s Bazar municipality held on 28th October 2017 at Cox’s Bazar municipality office. Dr. Mahafuzur Bhuiyan, Grant Manager, CTFK, Mr. Sharf Uddin Ahmed, Chief Executive Officer of Savar Municipality, Mr. Riasat Riaz from CTFK, Mr. Mahabubur Rahman, Director (Social Development) of YPSA, Ms. Nasim Banu, Team leader of Tobacco Control Program, Mr. Md. Harun, Mr. Omar Shahed from YPSA and Ms. Shamim Akter, Focal point officer of tobacco control program of Cox’s Bazar municipality were present in the meeting. YPSA shared the concept of model tobacco free Cox’s Bazar City with the Mayor. He agreed with the concept and gave his consent to lead the process of Tobacco free Cox’s Bazar city initiatve. He also decided that he will issue a letter to all restaurant –hotel in Cox’s Bazar Municipality area for implementing smoke free provision, coordinate with Cox’s Bazar beach committee for declaring the beach as smoke free public place, include the tobacco control issue in their monthly meeting agenda, print no smoking signage with their allocated budget, take initiative to limit the tobacco sale through introducing tobacco licensing and will arrange a planning meeting on tobacco free Cox’s Bazar city in November. 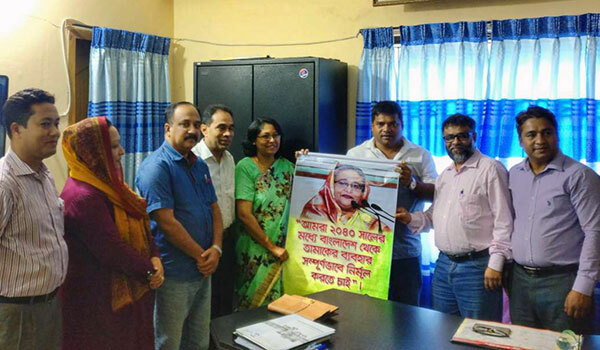 YPSA and CTFK handed over a poster with the declaration of Prime Minister on Tobacco Free Bangladesh by 2040. He also finalized a slogan for tobacco free city “Tobacco Free Cox’s Bazar – it is our commitment”(Tamakmukta Cox’s Bazar – E amader ongikar”. 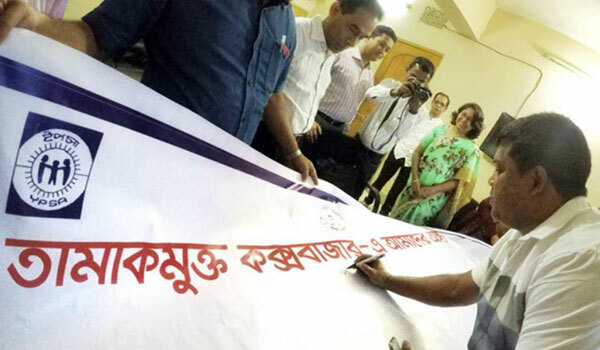 Finally, Mayor inaugurated the Tobacco Free Cox’s Bazar City initiative and singed the banner with the slogan of of tobacco free city.